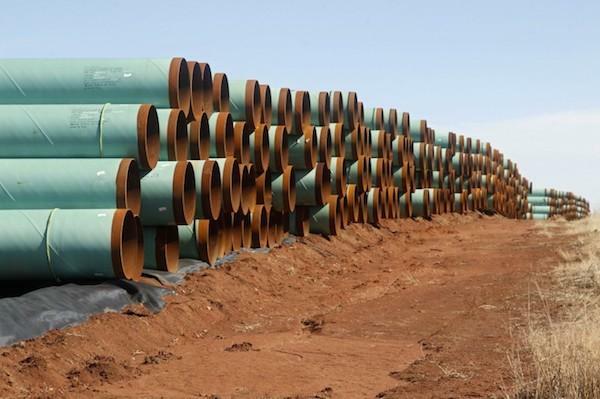 Pipeline sections piled up in Cushing, Oklahoma, the hub of the proposed Keystone XL project. Several indigenous leaders have officially asked President Barack Obama to reject the Keystone XL oil pipeline, citing concerns about consultation, treaty rights and impact on tribal homelands. In his letter to Obama, Great Plains Tribal Chairman’s Association chairman and Oglala Sioux Tribe president John Steele also requested a meeting with U.S. Department of the Interior Secretary Sally Jewell. The association is among numerous indigenous leaders coming out against the pipeline, which would carry bituminous crude from the oil sands of Alberta, Canada to the coast of the Gulf of Mexico for export. The Yankton Sioux are currently spearheading a challenge to the permit of TransCanada before the South Dakota Public Utilities Commission, a process with hearings beginning in May. The move is also backed by the Indigenous Environmental Network and other conservation groups. Debate is heating up over the Keystone XL pipeline, which when complete would stretch 1,700 miles from the oil sands of Alberta, Canada to the Gulf of Mexico coast of Texas. As Obama mulls a final decision amid Congressional pressure to step up the pace, the southern leg of the pipeline is already built and operational, bringing oil from refineries in the Midwest to the Gulf for export. 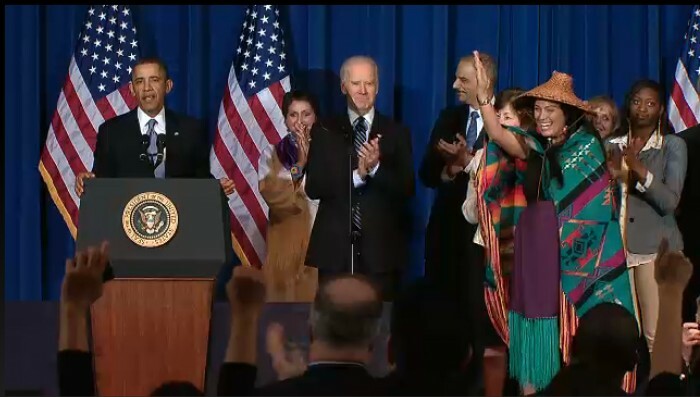 On March 8, 2013, President Barack Obama this morning signed into law the reauthorized Violence Against Women Act that includes tribal provisions. What’s left of the 210-foot-high Glines Canyon Dam, a section of about 30 feet, is awaiting a final blast in September. In the distance, the bottom of former Lake Mills today forms part of the new Elwha Valley. 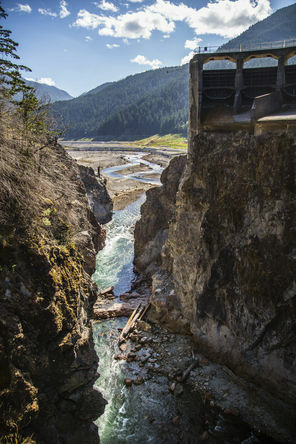 The last dam will be blasted out of the Elwha River sometime next month, cementing the hopes of generations of advocates and tribal leaders who fought to make it happen. With the concrete out, the long-term revival of a legendary wilderness valley in the Olympics can now unfold unfettered after 100 years dammed. The watershed already is springing back to life from the mountains to the sea: Salmon are swimming and spawning miles above the former Elwha dam site. Alders stand more than head high as the native forest reclaims the former lake beds. There’s a soft, sandy beach at the river mouth, where before there was only bare cobble. And birds, bugs and mammals are feasting on salmon eggs and carcasses as fish once again nourish the watershed. The Elwha is a rare chance to start over on a grand scale. The $325 million federal project, begun three years ago, has reopened 70 miles of habitat for steelhead and salmon, rebuilt wildlife populations and restored native plants. The river is hard at work with its restored natural flow, rebuilding its plunge pools, log jams and gravel bars. While it will never be the Eden it was, the Elwha one day likely will be pretty darn close — and sooner than many expected. The dams were built beginning in 1910 for hydropower, but lacked fish passage. It took an act of Congress, passed in 1992, to finally take down Elwha Dam and then Glines Canyon Dam, about eight miles above it. Unbuild it, and they will come: Salmon have been storming back ever since Elwha Dam was blasted out of the way in March 2012. Taking down Glines Canyon Dam has taken longer, in part because it holds back a larger load of sediment. Managing the release of about 27 million cubic yards of sediment as the dams come down is why removal has taken so long. There was so much sediment stuck behind the former Glines Canyon Dam alone that, stacked up, the pile would tower more than twice the height of the Empire State Building, notes Jonathan Warrick, of the U.S. Geological Survey. The dams were lowered notch by notch, allowing the river to naturally flush about half the total sediment load downriver and out to the Strait of Juan de Fuca. There have been bumps along the way. A water-treatment plant — the single most expensive part of the project — failed when a critical intake clogged with debris rinsed out by the river, delaying removal by a year while repairs were made. The tribal hatchery and federal fish-restoration plan, which includes stocking of some hatchery fish, have been a magnet for lawsuits and controversy. But nature, meanwhile, has carried right on. Ian Miller, a coastal hazard specialist based in Port Angeles for Washington Sea Grant, has been monitoring the beach at the river mouth. A beach that used to be too rocky to comfortably walk on is today used by kids to play soccer. Meanwhile, fat chinook salmon are cruising up the river. Staff from the Washington Department of Fish and Wildlife started working the Elwha in July with a gill net to eventually capture 1,600 big Elwha fall chinook. The fish, of both wild and hatchery origin, are taken to stock the next generation of Elwha fall chinook raised in the state rearing channel, used since the 1970s to preserve the unique Elwha strain. Working the fast current was a fish rodeo to capture, then quickly take the powerful, thrashing fish from the net unharmed. Long and thick as a thigh, the chinook, the largest in the Puget Sound region, are the celebrities of Elwha River restoration, and a major reason for dam removal. Elwha fish populations are projected to grow from about 4,000 to 400,000 over the next 20 to 30 years. Salmon already have hatched and migrated up- and downstream of the former Elwha dam site for the first time in a century. Revegetation — the most visible piece of the Elwha renewal project — also is unfolding dramatically. Already, terraced banks of the former lakes are burgeoning with alder and cottonwood, the gift of seeds carried by the lakes as they gradually were lowered during the drawdown that started dam removal. Most difficult to revegetate are the cobbly, gravel flats of the lake bed farther upstream, in the former Lake Mills, a land where many a planted Douglas fir and other seedlings have gone to die. But in other spots, cottonwood seedlings have established so thickly they look like a lawn. Alder trees seeded in 2011 as lake levels dropped now have grown more than head tall. Where there used to be bald sand, goldenrod buzzes with bees, and a young, stocky Nootka rose bush conceals a bird’s nest full of eggs. In all, more than 500 acres of former lake bed are being replanted, with nearly 60 varieties of native grasses, flowers, woody shrubs and trees from the Elwha Valley through 2018. Dam removal also is kick-starting broader effects in the ecological systems of the watershed, from its food chain to the home ranges of animals. Kim Sager-Fradkin, wildlife biologist for the Lower Elwha Klallam Tribe, already has tracked fish-eating otters to parts of the Elwha that salmon have recolonized since dam removal, and documented an increase in the otters’ nutrient levels derived from fish. John McMillan, a biologist with National Oceanic and Atmospheric Administration (NOAA) Fisheries walking the tributaries since dam removal began, said that in the first year he saw salmon carcasses on the riverbank. But now he doesn’t because the otters, bears, cougars, bobcats and mink have learned to take advantage of food where for so many years there was none. Take a walking tour of the Elwha River with Park Service rangers on the former Lake Aldwell. Tours are on Tuesdays and Sundays at 1 p.m. through Sept. 2. The hourlong walks are free, and begin at the former boat launch at the end of Lake Aldwell Road, north off of Highway 101 just west of the Elwha River Bridge. For more information, call 360-565-3130. Doctors, tribal leaders, business owners and concerned parents are among those cheering a potentially major blow to Big Coal. On Monday, an Oregon state agency announced its rejection of a permit for a coal export facility on the Columbia River. The proposed Coyote Island Terminal is one of three remaining projects being pushed by the fossil fuel industry to create a coal export superhighway through the Pacific Northwest. Three previous proposals have already been dropped. The Oregon Department of State Lands cited disruption to waterways and harm to tribal fisheries among its reasons for the refusal, which makes future approval of the port unlikely but still possible if the company pursuing the project files a convincing appeal. About three years ago, Wood and his son, Aiden, then 9, were salmon fishing on the Columbia River. As they returned to their car, Aiden spotted small clumps of coal near some railroad tracks. He soon realized that the coal likely came from the open rail cars that shuttle along the Columbia River to Canadian ports. That recognition helped push him to join with thousands of others across state, economic and political lines who have tried to thwart the proposed increase in the number of these coal trains rolling through the region. The mile-plus-long trains originate at mines in the Powder River Basin of Wyoming and Montana and head west to meet up with Asia-bound ships. Opponents, who have been protesting and signing petitions for a few years now, worry that more coal trains could ultimately lead to problems ranging from local traffic delays and health harms due to air pollution, to faster climate change as a result of more coal-burning overseas. Proponents of the coal ports, meanwhile, contend that greater exports mean needed jobs and tax revenues for struggling Western towns and Native American reservations. The U.S. has seen a steady decline in domestic coal use in recent years thanks to tighter federal regulations and the expanded viability of natural gas and renewable energy. But the rise of coal-hungry economies in China, India and other fast-developing nations offers a promising alternative market for coal companies. If government agencies eventually grant approval to all three export terminals proposed for Oregon and Washington, up to 100 million metric tons of the combustible rock per year could soon pass through the Pacific Northwest. The Coyote Island Terminal on the Port of Morrow at Boardman, Oregon, would account for less than 10 million metric tons of that total. “We are evaluating our next steps and considering the full range of legal and permitting options,” added Liz Fuller, an Ambre Energy spokeswoman. With the door still open for the Coyote Island Terminal to be approved, as well as for the other two port proposals in Washington state, opponents are voicing somewhat restrained optimism. Among the most vocal opponents have been Native American tribes whose reservations lie in the coal trains’ path. “Yakama Nation will not rest until the entire regional threat posed by the coal industry to our ancestral lands and waters is eradicated,” JoDe Goudy, the Yakama tribal council chairman, said in a statement Monday night. On Sunday, the Lummi Nation, whose reservation neighbors one of the proposed ports in Washington state, launched a totem pole journey — a road trip with totem pole in tow — that they hope will consolidate tribal opposition to Big Coal and Big Oil. Meanwhile, there are other tribes that could benefit from coal exports. As HuffPost reported in January after the Lummi Nation’s first totem pole journey, the Crow Nation of rural Montana argues that it desperately needs to develop its coal reserves to lift its people out of poverty. Dr. Robert Merchant, a pulmonologist in Billings, Montana, who deals with the health problems related to coal mining near his city, acknowledged the dilemma. 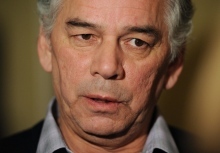 “There are a lot of people that would stand to have substantial gain from the extraction industry,” he said. But he also sees the high public costs associated with the industry. Montana, Oregon and Washington are among Western states battling forest fires this summer and suffering the resulting poor air quality. Scientists warn that such blazes are becoming more frequent and intense with the changing climate and that coal plays a significant role in this shift. Then there’s the blowback of toxic pollution from Asia’s coal-fired power plants. “Plumes come right across the Pacific,” Merchant said, noting that they can further contaminate the West’s air and water with toxins such as mercury. Perhaps of most immediate concern to many opposed are the trains, barges and ships themselves, which block roadways for emergency vehicles, belch diesel fumes and blow coal dust. Diesel exhaust is known to worsen conditions such as asthma and chronic obstructive pulmonary disease, and may even raise the risk of certain cancers. The extent of the threat from heavy-metal-laden coal dust is less clear, although evidence is building. The public health implications spurred more than 3,000 medical professionals and public health advocates to sign on to letters requesting denial of the Coyote Island Terminal permit. In Oregon alone, 165 physicians voiced their concerns to the governor. “We are particularly concerned with the health of our most vulnerable populations: prenatal, early childhood, the elderly and those with pre-existing conditions,” they wrote. Wood and his family live within a half mile of coal train tracks. Trains pass within 300 yards of his restaurant and within 50 feet of a winery he helps operate. 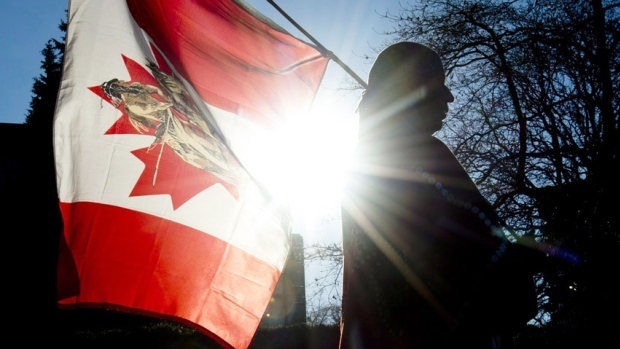 And since the challenges indigenous people face will be perceived as a self-inflicted suffering, many Canadians will feel absolved of any responsibility to First Nations, and will instead feel permitted to cast judgement and simply wait for civilization to reach the natives. This includes stripping communities of power in areas of social policy, extinguishing rights and title, reducing program resources, andgenerally trying to transform communities into municipalities under provincial jurisdiction. Tribal leaders are skeptical of a proposal by Gov. Jay Inslee to set new water-quality standards. Some tribal leaders and environmental groups say a water-pollution cleanup plan proposed by Gov. Jay Inslee this month is unacceptable because while it tightens the standards on some chemicals discharged to state waters, it keeps the status quo for others. Inslee is drafting a two-part initiative to update state water-quality standards, to more accurately reflect how much fish people eat, and to propose legislation to attack water pollution at its source. The fish-consumption standards have the effect of setting levels for pollutants in water: The more fish people are assumed to eat, the lower the amount of pollution allowed. Inslee decided that lowering some standards wouldn’t create a big-enough benefit to human health to justify the economic risk for businesses, said Kelly Susewind, water-quality program manager for the state Department of Ecology. 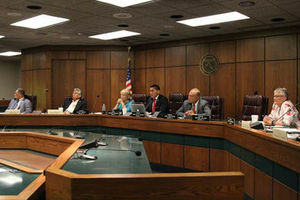 “The realistic gains on the ground didn’t warrant that concern and disincentive to invest in our state,” Susewind said. That’s because the rules regulate state permits for dischargers, such as industrial manufacturers and wastewater-treatment plants — but that isn’t where most of the pollution is coming from. Setting tougher standards for some pollutants would also result in levels too low to detect or manage with existing technology — but would create a regulatory expectation that could cloud future business investment, Susewind said. In the case of PCBs — polychlorinated biphenyls, industrial chemicals used as coolants, insulating materials, and lubricants in electric equipment — setting a limit below the existing limit of 170 parts per quadrillion wouldn’t improve people’s health, Susewind said. That’s because most PCBs are entering waterways from other sources, including runoff. “It is not the most effective place, to put the pinch on dischargers,” Susewind said. The problem is that the Clean Water Act, under which the standards are issued, doesn’t reach beyond so-called point sources: pollution in water discharged from pipes by industries and others regulated by Ecology and the federal Environmental Protection Agency (EPA). To gain new tools to clean up state waters, Inslee has asked Ecology to put together legislation to expand its authority to ban certain chemicals, to keep them from getting in the water in the first place. The legislation, which is still being drafted, is intended to address so-called non-point sources of pollution. The governor has said he won’t submit a final water-quality rule to the EPA for approval until after the legislature acts. Christie True, director of King County Natural Resources and Parks, which runs the county’s wastewater-treatment plants, said she was encouraged by the governor’s approach. “We have to be focused on outcomes,” True said. The debate now under way arose from the state’s need to update the water-quality standards that address health effects for humans from eating fish. The state’s rules today assume a level of consumption so low — 6.5 grams a day, really just a bite — that it is widely understood to be inadequately protective, especially for tribes and others who eat a lot of fish from local waters. The standard also incorporates an incremental increase in cancer risk in that level of consumption. Inslee has proposed greatly increasing the fish-consumption standard in the new rule, to 175 grams per day, a little less than a standard dinner serving. But he also upped the cancer risk, from 1 in 1 million under current law, to 1 in 100,000 in the new standard. That was to avoid imposing tighter standards for some pollutants. That isn’t good enough for tribal leaders who say they want tougher protection now — for all pollutants, not just some. “Holding the line isn’t good enough,” said Dianne Barton, water-quality coordinator for the Columbia River Intertribal Fish Commission. Counting on the Legislature to grant new authority to Ecology and money to back it up is also a shaky proposition, some said. “That is a big gamble,” said Chris Wilke, executive director of Puget Soundkeeper, a nonprofit environmental group that sued the EPA to force Washington to update its standards. Delay, meanwhile, “is more business as usual,” Wilke said. Brian Cladoosby, chairman of the Association of Washington Tribes and the Swinomish Indian Tribal Community, said tribes are going to take their case directly to the feds both at Region 10 EPA and in the EPA administrator’s office in Washington, D.C., and insist no change be made in the cancer risk. American Indian leaders and Native-focused legislators are pushing President Barack Obama to use his executive powers to establish a tribal economic development council made up of actual tribal leaders. Such a move, say advocates of the seemingly common-sense idea, would illustrate that Obama and his administration are serious about creating an overarching economic plan for Indian country, and it would put more weight behind a series of disjointed initiatives his team has already offered. They note, too, that the President of late has been willing to face scrutiny from Republicans by expanding his use of executive powers on immigration reform, health care, and other issues, so they wish he would add this pressing area to his agenda. And there’s already a model in place for him to do so, exemplified by his creation of the President’s Council of Advisors on Science and Technology through executive order in 2010. Indian leaders know full well that the president has already created a White House Native American Affairs Council, but they widely lament that it is made up mainly of non-Indian agency officials spread throughout the vast administration who don’t have the on-the-ground experience rooted in the realities of tribal economies. It makes for a good photo op when the administration’s council gets together, Tex Hall, chairman of the Three Affiliated Tribes, has said, and agency officials can therefore say they are focused on tribal economic development, as well as a bevy of other tribal issues. However, given the limited tribal input built in to this system, tribal leaders have feared that the council misses major opportunities to improve struggling reservation economies. To be fair, the administration and the council have indeed reached out to tribal leaders to solicit their ideas for bold and wide-sweeping improvement. During last year’s White House Tribal Nations Summit, for instance, Obama held a meeting with a small group of Indian leaders who suggested that the federal government encourage more collaboration between private business and tribes by convening a gathering of such entities. Ray Halbritter, Oneida Nation representative and CEO of Nation Enterprises, parent company of Indian Country Today Media Network, said after that presidential meeting, which he attended, that an advantage in having the administration facilitate such an endeavor is that it has power that tribes and Indian organizations lack. The administration has already made tentative and limited progress in improving reservation economies. During the president’s June trip to the Standing Rock Sioux Reservation, the White House noted in a press release that the administration has in several instances already partnered with Native communities by granting multi-millions of dollars in funding, by providing increased technical assistance on various federal-tribal programs, and by pushing for legal and regulatory tribal economy-focused improvements. New initiatives are also in the pipeline, the White House said, noting that the administration wants to remove regulatory barriers to Indian energy and infrastructure development, increase tribal land development opportunities, and make federal data focused on tribal economic development easier to find and use by tribes. Encouraging the use of tax-exempt bonds for tribal economic development, growing Native small businesses, and supporting Indian veterans were also on the agenda. Says Chris Stearns, a Native affairs lawyer with Hobbs Straus: “[W]ithout the direct input of tribal leaders, scholars, and activists into federal policy, you tend to wind up with piecemeal fixes that are not linked together in a way that makes them effective. “I can’t imagine that a Council on Native American Affairs led by the tribes themselves wouldn’t be able to come up with 10 times more than what a roomful of federal officials has been able to do so far,” Stearns adds. One of the reasons the administration has been reluctant in some cases to solicit stronger tribal input on economic development issues is the fact that many tribal leaders want federal laws that they feel impact their growth relaxed or removed. Progressive laws, like the Administrative Procedure Act (APA), the National Environmental Policy Act (NEPA), and the Endangered Species Act (ESA), are hindrances to development on many reservations, several tribal leaders have testified before Congress. Rep. Don Young (R-Alaska), chairman of the House Subcommittee on Indian and Alaska Native Affairs, is one who believes the administration has been slow in supporting economic self-determination for tribes because that goal often conflicts with its more progressive ideals. For instance, the congressman’s recent Native American Energy Act received tribal support from its conception to its passage in the House as part of a larger bill, yet the administration has opposed it all along the way. The bill, if ever signed into law by the president, could open up many opportunities for tribal energy development – both of the renewable and non-renewable type – yet it would also give tribes more of an ability to challenge NEPA and other regulations that hold them back from such development. Thus, the administration has been opposed—a major source of consternation to tribal advocates who note that Indian oil, gas and construction in aggregate garnered copy5 billion for a select group of tribes in 2013. Many more tribes could be able to benefit if Young’s legislation became law. Such criticism from a Republican is perhaps expected in partisan Washington, but Jon Tester (D-Montana), chairman of the Senate Committee on Indian Affairs (SCIA), agrees that the progress of both the administration and current Congress has been too sluggish and not focused on supporting true tribal self-determination. A step in the right direction, Tester says, would be for the president to create a permanent Cabinet-level Native affairs advisor position that could elevate these issues to the highest level of federal government in conjunction with appointing a tribal economic development council to inform such an advisor. “If in fact this is something that can happen, we will talk about it as a committee, and send a letter off,” Tester says. On Friday the 13th, President Barack Obama will be visiting tribal Leaders and other tribal members during his visit to the Standing Rock Sioux Indian Reservation. In light of this historic day, we know that you in Indian country will be there in person or spirit. We want to hear from you tomorrow on Twitter. So, if you want to join us or tweet to us, correspondent @VinceSchilling will be listening and tweeting live from our @IndianCountry twitter account. All day long, we are asking for your comments, pictures, thoughts and tweets. 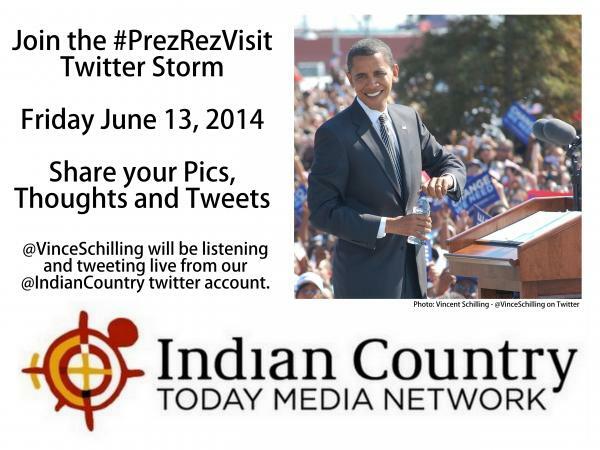 We will be tweeting using the #PrezRezVisit hashtag. So whether you are on site in North Dakota, watching coverage in Alaska or Florida or blogging from San Francisco, ICTMN wants to hear your thoughts and see your pictures from the day. We will be retweeting you and might include among the day’s best tweets in our follow up article. Remember, use the #PrezRezVisit hashtag.